The recipe for Horse balsam contains extracts from 25 herbs. The substances of these extracts have various mechanisms of action but the same goal - to relieve pain, speed up recovery, reduce inflammations, etc. Some of the herbal extracts contain active components which optimise the activity of the main active substances or reduce allergic reactions. Comfrey was the basic medicine of Greek and Roman "war healers" (it let flesh grow together). In the Middle Ages comfrey was commonly used for healing of fractures, which its name comes from. The roots were shredded and used the same way as we use plaster today. Paste from the roots got stiff quickly, like plaster. It was used for thousands of years for fractures, contusions, sore spots, abrasions. In the past, baths in comfrey were also popular. Its external application has primary importance. It is used as a bandage in bruising, inflammation of veins, chronic diseases and gout or varicose veins. 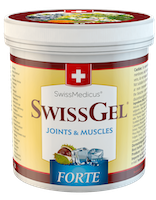 It helps in treatment of fractures and healing of wounds, edemas, ulcers, bruising and contusions. Comfrey supports creation of healing tissue but it should not be used in deep wounds because it accelerates superficial healing before the wound is healed inside, which may cause abscesses. In folk medicine it is recommended for open varicose veins and crural ulcers. It is also used as a tincture or therapeutic oil. The root is a more effective part. Active ingredients: allantoin, asparagin, lasiocarpin, methylpyrinin, essential oil, tannins, a number of other alkaloids. Horse chestnut is a tall tree originating from the Balkans. In Hungarian, this tree is called bokrétafa = a bouquet tree. It was brought to our region in the 18th century. It was first described as a therapeutic herb by Matthioli in the 16th century. In 1615 it was brought from Istanbul by a French traveller and planted in Paris. Over the next 100 years it spread all over Europe. The Californian indigenous people threw the crushed berries into the lakes to muddle fish so as to catch them easily. Its therapeutic effect on haemorrhoids was first mentioned in 1896. The seed (chestnut), flower and young leaves are used. Active ingredients: aescin, quercetin, caempherol and others. reinforce venous walls and adjust vascular tone in chronic venous insufficiency have an effect on cramps and so-called "heavy legs"
The name horse was acquired by the chestnut because the seed was used by Turks as a tonic for draught horses and for easing breathlessness of horses. Another possible way that the name was created is that it seemed like a horse eye to our ancestors. Goats and pigs like chestnuts. It is probably because of its bitter taste. According to ancient beliefs we should keep chestnuts in our pocket because they protect against evil. They can protect against evil until they lose their lustre. During World War II chestnuts were used as a source of starch. The Chestnut flower is a symbol of Kiev, the capital of Ukraine. The main places of occurrence of juniper are Europe and Asia. In Europe it is almost cosmopolitan. It can be found from lowlands to mountains (Monte Rosa 3,700 metres above sea level). The therapeutic glory of juniper started in the Middle Ages when Arabs produced an unusual marmalade from juniper that is still stated in some older pharmacopoeias today. Juniper has long been associated with ritual cleansing and fire places in the temples as a part of the regular cleansing ceremonies. Several pharmacopoeias were also preserved in the Egyptian papyruses originating in 1550 A.D. It is used internally in inflammations of the urinary tract and for the treatment of flatulence (indigestion –fermentative and putrescent procedures in the intestines). 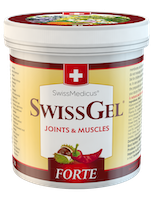 It improves metabolism in joints for which, together with the diuretic effects, it is intended for the treatment of joint rheumatism. The berries are the used part of the plant. Active ingredients: essential oil rich in monoterpens -especially terpineol. Juniper berries have long been used as a medicine in many cultures. The juniper berries have the effect of a strong urinary tract disinfectant if they are consumed. They were used by Indians as a herbal medicine for urinary tract infections. Western tribes mixed the juniper berries with the root of barberry (Berberis) in herbal tea for the treatment of diabetes mellitus. The original inhabitants of America used juniper as a female contraceptive measure. Juniper berries were used for home beer production at the beginning of the 20th century. Juniper berries were used for production of brandy in Poland and Slovakia, especially in the region of the White Carpathian Mountains where the popular "borovička" spirit was made. The essential oil in juniper has excellent purifying properties, helps with urinary tract infections, cleans the blood, has antiseptic effects on the respiratory tract, is effective on muscle and rheumatic pain, and supports perspiration. Arnica is a very old therapeutic plant; the tincture from flowers of this plant was always appreciated and the spectrum of use was quite extensive -from bruising to rheumatism and treatment of stroke. It was picked so extensively that it disappeared from the original places of occurrence. Arnica is toxic. It is used internally only in homeopathy. Arnica increases sweating and has antibacterial effects. It causes reabsorption of internal bleeding in contusions and distortions. It reduces inflammation and relieves cramps. It is suitable mainly for external use. It has astringent effects. Active ingredients: essential oils, flavonoids (sesquiterpen lactons -helenin) and tannins. The used parts: essential oil is extracted from needles, buds and resin. Active ingredients: pinene, terpinen, succinic acid, salicylic acid and others. Popular names: Scots fir, Riga pine, Norway pine, Mongolian pine. The resin from pine contains turpentine oil It contains pinenes (about 15%) Essential oil is a strong irritant and is effective in arthritis and rheumatic pain. It is effective in rheumatic and muscle pain due to strain. 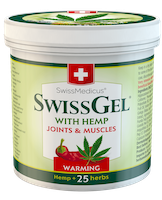 It supports blood perfusion and cleans the skin. It improves blood circulation. It has very similar effects to Scotch pine. Both belong among the important components of the recipe. Rosemary originated in the Mediterranean (it often grows directly at the seaside from where its Latin name was possibly derived ros=rosa and marinus=sea, i.e. "sea rosa"). Rosemary has been used since the Middle Age as a seasoning, medicine and incense. It improves blood circulation, eliminates the feeling of cold in the limbs and helps with so-called "elderly heart". It improves the tone of the vessels, nervous system and it has a general supportive effect; therefore it is proven in convalescence and geriatrics. Rosemary is also excellent for external use. A strong infusion of rosemary is used for purification of oily skin, washing of eczema and for wounds and contusions. It is very popular in aromatherapy. Spreading of rosemary oil on the skin (two drops of 100% natural essential oil per two to three spoons of virgin oil) or tincture improves its perfusion and relieves stiff and strained muscles and joints. Rosemary essential oil plays a significant role in Horse Balsam. It is used for reduction of rheumatic pain. It is also a very strong antioxidant. Essential oil is taken from the flowering tops and leaves. Because it was always associated with the myth that is sharpens memory it became a symbol of faith. It was also believed that it was suitable for cleaning a room with ill patients due to the essential oils that were released from burning it. The Matthioli herbarium states that rosemary wood was used for making cithers (musical instruments). Rosemary oil was the first essential oil. Rosemary has a very strong odour and beautiful flowers. No wonder that in the Ancient World it was used in songs as a symbol of love, marriage, death and immortality. It was used in incense, for manufacture of wreaths and as a decoration -from the hat of youth to the marriage bouquet and ceremonial table. Red hot chilli pepper came to the West from India in 1548. The berry is a strong stimulant for the whole body, increases blood perfusion, and stimulates the nervous system and energy. Therapeutic properties of chilli peppers are however quite broader. They help in treatment of pain and inflammation. Active substances: capsaicin, carotenoids, saponins. Its effects are similar to cortisone. Capsaicin initiates elimination of ACTH, a hypophysal hormone. ACTH have anti-inflammatory and antiallergic effects similar to cortisone. Eucalyptus was used in traditional medicine of Australian aboriginals for fever. It was brought to the West in the 19th century by the Director of the Melbourne Botanic Garden, and it was grown as a tree in Southern Europe and Northern America. Its leaves were used in the traditional medicine of Australian aboriginals as a dressing for wounds or inflammation. The herb has been used since 1840 in flu and cold, rhinitis and blocked nose. The leaves are the used part. Active ingredients: essential oil rich in cineol and eucalyptol. Ginkgo, which originated at least 200 million years ago, disappeared from nature a hundred years ago. However it can be found in the gardens of temples in the Far East. This deciduous tree with separated male and female species came to Europe in 1730 and became a popular decorative tree. Since the 1980s there has been increasing interest in this plant because of its therapeutic effects. The leaves are used for haemorrhoids, varicose veins and ulcers on the lower limbs. In traditional Chinese medicine it is used to reduce edemas in a wet environment. Its therapeutic effects were first mentioned before our era. It was used as a basic herb against various allergies. It is used in the recipe for Horse balsam to reduce and minimize the risk of allergic reaction. Because of the fact that each active substance taken from the plants is a potential allergen this risk must be minimized. Despite this, the recipe contains 25 herbs and therefore there is a high risk of allergic reactions. Due to the content of Baical skullcap in Horse balsam there are practically no allergic reactions. This traditional Indian herb came to Europe in the second half of the 19th century. We do not classify it among the active components of the product because the maximum final effect with purple coneflower is achieved when taken internally. Active ingredients: echinocoside, alcylamides, echinacein and others. It is a traditional herb with a broad spectrum of effects. The first notes of agrimony are dated 120 years before our time. It has been used on wounds since the times of the old Saxons. In the 15th century, it was the most important part of "arquebuse water" the field medicine for gunshots. It is good on inflammations of the skin and ulcers and it stops bleeding from wounds. Active ingredients: tannins, terpens, flavonoids and their derivatives (lutein, apigenin, hyperosid) and a high amount of silicic acid. The used parts are leaves or tops. Peppermint contains essential oils with a high content of menthol, bitter substances, tannins and flavonoids. Essential oils cause mild relief of cramps. Menthol have a cooling effect and reduces pain. Externally, peppermint is used in tense headache or edemas when it cools, supports perfusion and refreshes. Another traditional and relatively wide-spread herb is used in the recipe for Horse balsam for its calming and healing effects on the skin. It is used externally in a wide range of skin problems and inflammations. Because some of the used herbs are relatively aggressive for the skin, marigold should be used to eliminate these undesirable side effects. It was used by the Romans. The word thyme originates from the Greek word meaning courage. It is contained in the recipe for Horse balsam because of the content of thyme essential oil (so-called thyme camphor), which contains a high amount of thymol and carvacrol. It has strong effects against cramps. The blueberry berries and leaves are rich in glycosides, which have a considerable vasoprotective effect. It accelerates absorption of edemas. They improve metabolism and speed up tissue regeneration and recovery. In the past snake root was used in traditional medicine mainly as an antidote against snake bite and also to stop bleeding. It is an exceptional herb. Most of its effects are achieved after internal use. It is in the recipe for Horse balsam especially because of its ability to heal ulcers, contusions and to reduce pain. It was added to the recipe for Horse balsam because of its antioxidative property. Because it causes detoxification it improves local metabolism and hence tissue regeneration. When used internally, it is effective in atherosclerosis, and improves firmness and elasticity of veins and capillaries. It is used in traditional medicine especially for its antibiotic properties. It is in the recipe for Horse balsam, like lemon, to purify and support blood circulation. The advantage of grapefruit is that it stimulates the lymphatic system. Essential oil taken from the lavender flowers is rich in monoterpens. The active substances are linalol, linalacetate and Termina-4-ol.In the recipe for Horse balsam it supplements the herbal composition with its anti-inflammatory effect. It is used for the treatment of rheumatic inflammations, or gout attacks. The used parts are its flowering tops. The anti-inflammatory effect is caused by ursolic acid. This acid increases the activity of lipooxygenase (according to French scientists it should protect the body against cancer). The used parts are berries and leaf. It has strong antirheumatic effects. The main action is however achieved after internal use. Ancient Romans called it chamomile due to its smell of "earth apple"; for Anglo Saxons it was one of nine sacred herbs given to the world by the God Odin. The advantage of chamomile in the recipe for Horse balsam is that it reduces itching of the skin. Because of its pungent and warming taste, cinnamon is suitable for all types of diseases "caused by cold", from rhinitis and stomach cold to arthritis and rheumatism. It was used in the recipe for Horse balsam for its warming properties. Other effects occur after internal use.